The Mardi Gras inspired dessert is made with a cinnamon cake flavored ice cream, tasty pastry pieces and a colorful cream cheese swirl with festive candy sprinkles. 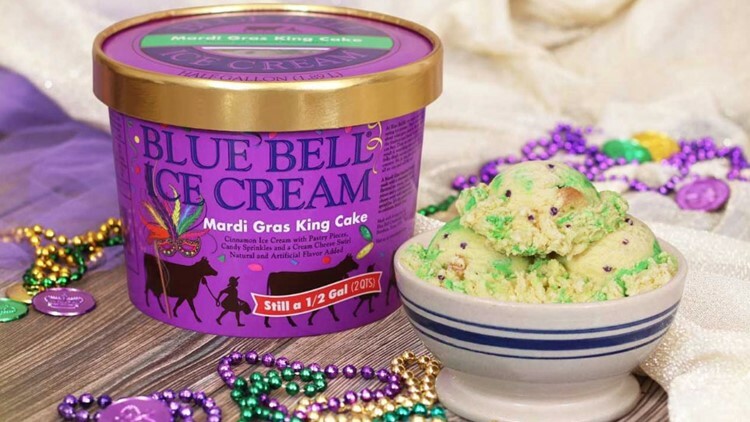 BRENHAM, Texas – Blue Bell Ice Cream is kicking off 2019 with a new flavor for the Mardi Gras season! Mardi Gras King Cake Ice Cream will be released to stores this week in the half gallon size. To sweeten the occasion, for the first time, the flavor is available in all areas that sell Blue Bell products. Blue Bell enthusiasts may remember that Mardi Gras King Cake is a combination of two previous flavors, Mardi Gras, introduced in 2004, and King Cake, first produced in 2006. And just like the annual celebration, Mardi Gras King Cake Ice Cream is only available for a limited time.